We offer Fire Rated Access Doors! The MIFAB MFRU fire rated access door is approved by Underwriters Laboratories Inc. for 1 1/2 hours. "B" label in walls. Material - MFRU Series is 16 gage satin coat steel door and frame. The MFRUSS Stainless Steel Series is 16 gage #304 stainless steel door and frame. Door - Flush to frame. Self-closing. 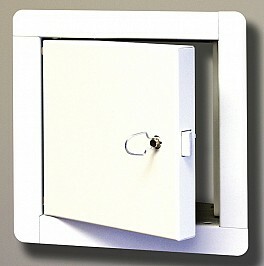 Can be opened from the inside or back of the door with MIFAB's unique thumb turn latch. Frame - Four piece welded frame with masonry mounting straps. Latch - Standard - Flush mounted, interchangeable turn ring operator and key operator latch. Optional - cylinder key lock. All of MIFAB's cylinder key locks are keyed alike. Fire Rating - Underwriters Laboratories "B" label. 1 1/2 hour for walls. Insulationnot required. Give us a call for pricing, or if you have any other questions.